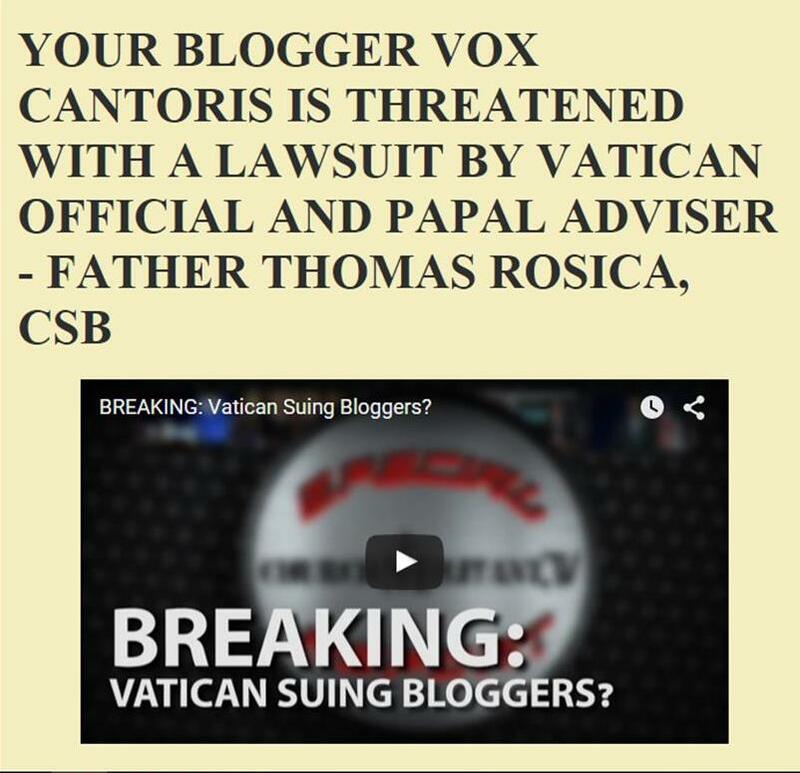 Vox Cantoris: Roman Bishop Bergoglio is a blasphemer - God is "unjust, he sent his Son to a cross!" In what has provoked in my gut the urge to vomit not unlike that which I felt that evening in March 2013 when Jorge Bergoglio emerged on the balcony of St. Peter's Basilica, the Bishop of Rome has blasphemed God the Father; accusing Him of being "unjust" for sending "His Son to a Cross!" In rambling statements filled with incoherent blather upon a visit with patients and staff to the Paul VI Audience Hall from Rome's Bambino Gesù Children's Hospital, Bergoglio not only blasphemed the Most Holy Trinity, but insulted doctors insinuating "corruption" stating in front of children dying of cancer that, "corruption is the worst form" of that terrible disease, thus not only insulting the doctors but ridiculing the children's own suffering. How does one even start? Could he, with his decades as a priest, not answer a simple question on why people suffer? Is he that stupid? Is he that uneducated? Perhaps, by looking at Holy Scripture, we can best rebuke this disgusting blasphemer on the matter of his commentary on God the Father. 5 For let this mind be in you, which was also in Christ Jesus: 6 Who being in the form of God, thought it not robbery to be equal with God: 7 But emptied himself, taking the form of a servant, being made in the likeness of men, and in habit found as a man. Our Lord Jesus Christ "humbled himself!" He "took on the form of a servant." St. Paul tells us that, "every knee should bow!" He did not say, "every knee but Jorge Bergoglio's!" This man grovels on the floor to wash the feet of men and women and non-Christians in a liturgy reserved for washing the feet of his priests. He grovels for man, but he refuses to genuflect to the the Most Blessed Sacrament at the Mass! Bergoglio is a scandal to the Faith! He defies St. Paul and the Holy Spirit while speaking of a "god of surprises," and whilst his minions tell us that every word emanating from his mouth and every expulsion of intestinal vapour smells of Frank-incense and is from the "spirit." Our Lord is clear, "The good shepherd lays down his life for the sheep." The remainder about the "hirelings" are these disgusting Romans, these popes and prelates and the\ sycophantic effeminates that surround him. These filthy hirelings who desire sacrilege with the Blessed Sacrament to adulterers and soon, protestant heretics. This is what we face with these malefactors in Rome and our dioceses. Let us turn now again to Saint John as he continues with Our Lord's words in verses 14-18. Bergoglio has directly contradicted Our Lord. Jesus gave up His life. He, "laid it down" and then He "took it up again." The Father loved Him because of this! The Father did not sacrifice Him, Jesus sacrificed Himself, willingly, humbly. He was slaughtered as a lamb, the true Lamb of Sacrifice. To call God the Father, "unjust," - He who is Justice, is blasphemy. It is a lie. It is an abomination. He is not infallible. he is spinning a web of confusion and error. This is not the first time Bergoglio has used his opinions and fantasies to contradict Holy Scripture and Tradition. Who will confront this malefactor on the Chair of Peter over this blasphemy? Where are the Cardinals and Bishops and Priests who will denounce this man? The supreme leader of the Bergoglian church is ready for retirement. An unjust God sending his son to suffer has a large whiff of Calvinism. Enough! Enough of this mess! When will the Bishops of the world stand up for the faith and for the faithful? These are lies purposefully being spun into a web of confusion for the purpose of destroying the faith. Shame on him. What of all the souls he is leading into hell by his false teaching? Their fate lies on his shoulders. And those Bishops who will not speak out. And those who support his evil plans. God Bless Cardinal Burke and those like him who recognize and call out the works and the minions of Satan. Pope Francis gives this type of eisogesis because he feels he is "lead by the spirit" and I believe he is. The problem is, he is so much a believer in the Charismatic movement that he doesn't even test the spirits as advised in scripture and Tradition. So the "spirit" leading Pope Francis could be anything including his own delusion (at best). It's quite unbelievable that a pope can get away with the continuous blasphemy, heresy, name calling Traditional Catholics (clerical & lay), foul language & bad example on the scale that PF is, yet the four Cardinals are vilified. Despite the backing of many petitions, letters, public pleas from priests, academics & laity this excuse of a pope rides roughshod over everyone. He cannot answer simple & unambiguous questions because he obviously doesn't believe in God so isn't inspired by the Holy Ghost, although his supporters seem to think PF is, indeed, the Third Person of the Holy Trinity as everything he pontificates on is put down to the inspiration of the Holy Spirit. In fact, it can only be put down to the unholy spirit that the Vatican reeks of. It is now vitally important that the formal correction is made promptly and this man exorcised, removed to a psychiatric hospital & thence to a monastery for the remainder of his life. The condition of the soul affects the body so both must be attended to & made whole again. The CC must be brought back to Tradition which is the only cure. Belief in the Real Presence, penance, sacrifice, worship, keeping the Commandments, honouring the Sacraments & availing of them on a regular basis, must become again the standard by which we live our lives & bring up our children. For over fifty years now our leaders have ditched the Old Rite along with most of the Sacraments, catechesis, evangelisation in their obsession with NWO religion to annihilate God from the world community & make everyone pay lip service to the likes of Soros & Co. When will the media catch themselves on & stop exonerating this man whose bad influence is permeating society in general & will in time affect their own families. When will apathetic Catholics/Christians see that the way PF is leading us is not the way of the Cross but the way of perdition? Don't just walk away. The One Holy Catholic & Apostolic Church is the ON LY one instituted by Christ Himself on the First Apostles & the Papacy was given by Him to St. Peter who laid the foundations for His Church in Rome & died there for it along with St. Paul. Does this fact not require us to stay put & FIGHT to get these malefactors removed for all time? Words just can't capture the scale of the "imbicility" of this cretin. Please indulge me. It is very hard for me to find fellow Catholics who are upset at this p*pe. Doesn't this idiot destroy the entire reason for, and claims of the Church? Is there a reason why everyone can't see this, and try to claim otherwise? Thanks Vox for giving people like me a place to let off steam. And if I am correct, and if this p*pe is not condemned, then THE Church no longer exists under this Vatican, this Rome. He is Pope of meaninglessness, Prince of chaos, Lord of the flies. This a case where the sheep must reject the shepherd as you are doing so well Vox. Just as Christ spoke out against the corrupt religious leaders of His time so must we, who are trying to imitate Christ, do the same. The emperor has no clothes! I wish you were there t Vox, to rebut his lies. You would have made headline news. So sad that the masses are going along with this man. It's like a Jim Jones phenomena. Everyone drinking the poison. «Shortly after the mid-Twentieth Century, the passions will erupt and there will be a total corruption of customs for Satan will reign almost completely by means of the Masonic sect». *** «The Sacrament of Matrimony, which symbolizes the union of Christ with His Church, will be attacked and deeply profaned. Freemasonry, which will then in power, will approve iniquitous laws with the aim of doing away with this Sacrament». «Moreover, in these unhappy times, there will be unbridled lust ... Innocence will almost no longer be found in children nor modesty in women. In this supreme moment of need of the Church, that one who should speak will fall silent». *** «During this epoch, the Church will find Herself attacked by terrible hordes of the Masonic sect ... The vices of impurity, of blasphemy and sacrilege will dominate, in these times of depraved desolation and that one who should speak will fall silent». «The fury of the devil, in trying to raze the Catholic Church, would be served by Her children who would lose their faith. They would work to oppress the Church, and prevent public devotion for they would have already entered the party of Satan, by becoming members of Masonic Lodges... and the loathsome and pestiferous wild boar of Freemasonry would enter the beautiful and flourishing vineyard of the Church, leaving it in complete ruins and destroyed». *** «The Masonic Sect will be so subtle as to penetrate into the heart of families in order to corrupt the children, and the Devil will pride himself in dining upon the exquisite delicacy of the hearts of children». *** «Know that the Divine Justice sends terrible punishments on entire nations, not only for the sins of the people, but above all for the sins of Priests and Religious... Deviating from their sublime mission they will deteriorate to the point where that, in the eyes of God, they are the ones to accelerate the severity of punishment». @fedhill: I thought the very same thing. There we see how the utter pessimism of the Protestant heresiarchs brings, by reaction, to false optimism and disgusting impiety. If God is not just, who can be? Better if whe keep sinning on! Modernism is nothing else but Liberal Protestantism in disguise, brought to its final, logical, de facto atheistic conclusions. BTW, in answering the nurse's question, he says he doesn't know the reason children suffer. Last time I checked, all suffering is the result of Original Sin. That's Elementary School Catechism. In The Sincere Christian, pages 31 -42, Questions 17 -21, Bp. Hays explains suffering magnificently. It has to be read slowly and carefully, but it puts the soul to rest. My New Year's resolution is to read all four volumes. The essence of perfection is to embrace the will of God in all things, prosperous or adverse. In prosperity, even sinners find it easy to unite themselves to the divine will; but it takes saints to unite themselves to God's will when things go wrong and are painful to self-love. Our conduct in such instances is the measure of our love of God. St. John of Avila used to say: "One 'Blessed be God' in times of adversity, is worth more than a thousand acts of gratitude in times of prosperity." Furthermore, we must unite ourselves to God's will not only in things that come to us directly from his hands, such as sickness, desolation, poverty, death of relatives, but likewise in those we suffer from man -- for example, contempt, injustice, loss of reputation, loss of temporal goods and all kinds of persecution. On these occasions we must remember that whilst God does not will the sin, he does will our humiliation, our poverty, or our mortification, as the case may be. It is certain and of faith, that whatever happens, happens by the will of God:"I am the Lord forming the light and creating the darkness, making peace and creating evil." From God come all things, good as well as evil. We call adversities evil; actually they are good and meritorious, when we receive them as coming from God's hands: "Shall there be evil in a city which the Lord hath not done?" "Good things and evil, life and death, poverty and riches are from God." It is true, when one offends us unjustly, God does not will his sin, nor does he concur in the sinner's bad will; but God does, in a general way, concur in the material action by which such a one strikes us, robs us or does us an injury, so that God certainly wills the offense we suffer and it comes to us from his hands. Thus the Lord told David he would be the author of those things he would suffer at the hands of Absalom: "I will raise up evils against thee out of thy own house, and I will take thy wives before thy face and give them to thy neighbor." Hence too God told the Jews that in punishment for their sins, he would send the Assyrians to plunder them and spread destruction among them: "The Assyrian is the rod and staff of my anger . . . I will send him to take away the spoils. ""Assyrian wickedness served as God's scourge for the Hebrews'' is St. Augustine's comment on this text. And our Lord himself told St. Peter that his sacred passion came not so much from man as from his Father: "The chalice which my Father hath given me, shall I not drink it?" He replied that he too was mystified and was at a loss how to account for such happenings. "What devotions do you practice?" asked the abbot. He answered that there was little or nothing special that he did beyond making a great deal of willing only what God willed, and that God had given him the grace of abandoning his will totally to the will of God. "Prosperity does not lift me up, nor adversity cast me down," added the monk. "I direct all my prayers to the end that God's will may be done fully in me and by me." "That raid that our enemies made against the monastery the other day, in which our stores were plundered, our granaries put to the torch and our cattle driven off -- did not this misfortune cause you any resentment?" queried the abbot. "No, Father," came the reply. "On the contrary, I returned thanks to God -- as is my custom in such circumstances -- fully persuaded that God does all things, or permits all that happens, for his glory and for our greater good; thus I am always at peace, no matter what happens." Seeing such uniformity with the will of God, the abbot no longer wondered why the monk worked so many miracles. The media will jump if/when he does something politically incorrect. Jesus when to the Cross: 1) To make atonement for our sins 2) To open up the gates of Heaven for his followers to enter. So sad that Bishop Judas doesn't understand theology. Although his record is against him, I'm inclined to think this is mostly just Latin American metaphor. In conversation, Latin Americans often exaggerate to make a point. Lest anyone think he's "off the hook" for that as far as I'm concerned, absolutely not at all. He's supposed to be everyone's pope- even those "rigid" traditionalists. He should learn to speak to everyone, in a way that does not sow confusion. Then again, he seems to like sowing confusion- much like satan does. Someone in the English-speaking world sees that and thinks Francis literally means that "God is unjust," or that justice (i.e. hell, since we can't "earn" heaven) isn't that important. I'm sure many readers of this blog know the Baltimore Catechism. Let's look at Baltimore Catechism #1, question #13: What is God? God is a spirit infinitely perfect. -- Perfect. Infinitely. Justice is one of the cardinal virtues. Virtue is a moral perfection of God. God's justice, like everything else about Him, is infinitely perfect. Dan, at least we see it, so you have company. Faithful Catholic blogs are now a lifeline for most of us, because we are truly a scattered remnant, but thankfully can connect via this media. Someday they may figure out a way to shut it all down, but for now, here we are. This pope is a destroyer, but God will not abandon us. Most Catholics are sleeping. Peter Lamb, oh, to be that united to the will of God! That is perfect peace. I will likely never know it, I grumble and complain over everything, even the small. But it is a worthy goal! you are very helpful to me and I thank you very much. In this case I wonder, if Jorge Bergoglio is not saying to a nurse that if we were to see the suffering of children as unjust, we would also have to call Jesus' suffering on the cross as unjust. During his visit in the USA, Jorge Bergoglio said that humanly speaking, Jesus' death on the cross was a failure. Many you-tubers were then claiming that the pope called Jesus' death on the cross a failure. I am convinced that the man did not mean to say it all. He stressed the difference between our reasoning and God's logic. Could it be the case in his answer to the nurse's question as well? Jorge Bergoglio regularly say un- or anti-Catholic things. But I am not sure he did it in these two cases also. When I say to a person: You suffer because of original sin, I am troubled. I would not give this reason to a mother of a child dying of cancer. I would probably say: Humanly speaking, it seems unjust. Yet as Catholics we are told to trust God. We must pray that He fills your child with His Holy Spirit and supernatural understanding, and that you may find peace in knowing that you will meet your child in heaven again, and then you will understand. It is very hard for a mother to say to her child, who suffers of a serious illness: Nothing happens without the will of a just God. She could say: God knows why, I don't. If it were up to me, I would never let it happen to you. I would prefer to put myself in your place. Your Scripture quotes are very appropriate. In the Ukrainian Greek Catholic Church, Philippians 2: 5-11 is used for most Feasts of Our Lady and almost every Wednesday of the year (e.g. Great Wednesday, Bright Wednesday). John 10: 9-16 is the Gospel used for the consecration of a Bishop. I don't know what the Latin Tradition uses, but I'd bet you that the NO doesn't use that particular Gospel. Your hard work is much appreciated, Vox. Pure and simple HE IS NUTS and deserves the "net of the Fisherman". A frontal lobotomy would do him a world of good, thereby benefitting all mankind. Don't be surprised if he starts frothing at the mouth. In this situation, I think Francis didn't mean to blaspheme. The problem is the order of the words and ideas presented. It's hard to tell as this is clearly a translation, but Italian-speaking friends tell me that Francis is a poor and convoluted speaker, larding his sentences with a lot of "Ehhhhh?" and "Nooooo?" The impression they gave reminded me of the Rt. Hon. Jean Cretien doing his "'Ti' Jean" routine, only it was an affectation in the Prime Minister. Francis' homespun style is probably authentic. So verbally clumsy, yes. As usual. Unable to recall the writings of better men and explain them in clear language to the faithful? Yes, again as usual. Blaspheming? Probably not. Dorota, his implication that nurses should just change doctor's orders and give patients what THEY think is best, is misguided at best and diabolical at worst. In an era of assisted suicide, where "angels of death" are out there using methods to end life for people whom THEY believe are suffering, this is a seriously reckless thing for a pontiff to say. Hopefully he did not intend this confusion, but who on earth knows what this man's intentions are. From St. Alponsus Liguori's The Passion and Death of Jesus Christ "St. Bernard says 'in order to redeem the slave, the Father did not spare his own Son, nor did the Son spare himself.' O infinite love of God! On the one hand the eternal Father required of Jesus Christ to satisfy for all the sins of men: 'The Lord hath laid on Him the iniquity of us all.' On the other hand, Jesus, in order to save men in the most loving way that he could, chose to take upon himself the utmost penalty due to divine justice for our sins. Wherefore, as St Thomas asserts, he took upon himself in the highest degree all the sufferings and outrages that ever were borne. It was on this account that Isaias called him 'a man of sorrows, despised, and the most object of man.' And with reason; for Jesus was tormented in all the members and senses of his body, and was still more bitterly afflicted in all the powers of his soul; so that the internal pains which he endured infinitely surpassed his external sufferings. Behold him, then, torn, bloodless; treated as an impostor, as a sorcerer, a madman, abandoned even by his friend, and finally persecuted by all, until he finished his life upon an infamous gibbet. 'Know you what I have done to you?'" Page 30-31 to answer the heretical statement of Pope Francis by saying God is unjust by letting Jesus die. The Father willed it, to be sure. The Son cooperated. To say that the Father was "unjust" is simply absurd to be blasphemous, regardless. Brendan McGrath above gives the answer that every child learnt. I'm no theologian, but even I now that God cannot be "unjust." This just justifies the fact the Holy Spirit was not present when the Cardinals voted for the new Pope in the Conclave. The Conclave vote was corrupted by Cardinals Kasper and Marx who held a lobbying effort prior the Conclave. This was an evil act and it had to be done with with the approval of Cardinal Bergoglio. All this humility and baby kissing was an act and even that got really weird, like Joe Biden weird. The Three Persons in the Holy Trinity, the Father, the Son and the Holy Ghost are All Just from the beginning and for all eternity! A Pope can not change that as a matter of fact Pope Francis must confess that in his next visit to what Francis describes as torture chamber a Confessional. That's if he goes to Confessional it might be to rigid for him. I agree. I am no fan of this Nan Bergoglio, in fact, I am an ardent critic, as I truly think he is an anti-pope, but in this case case he is saying if you follow the logic that God is unjust in allowing suffering, then He is unjust in sending His Son to the Cross. Yet, once again Bergoglio speaks in veiled language when not speaking outright heresy. My sentiments exactly. I just don't know who to reach out to with my questions.